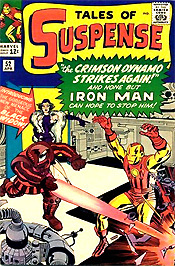 Black Widow (aka Natasha Romanova or Romanoff) - first appeared in Tales of Suspense # 52 (April 1964) - "Introducing The Gorgeous New Menace Of...The Black Widow", an orphan raised in a Cold War spy school, blessed with a strong immune system and delayed aging, the sole female Avenger! Hawkeye (Clint Barton) - first appeared in Tales of Suspense # 57 (September 1964) - "How Can One Man With a Strange Bow and Arrow Harm Ol' Shell-Head? 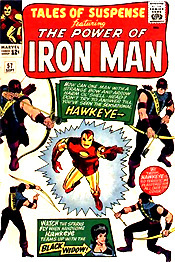 Don't Try to Answer Till You've Seen The Sensational Hawkeye", in a story titled "Hawkeye, The Marksman!" 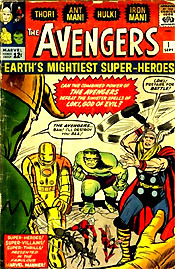 Soon after, Hawkeye joined the Avengers in The Avengers # 16 (May 1965), as a skilled cross-bow archer. 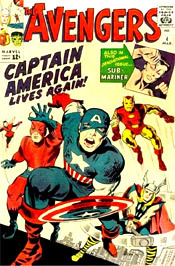 Other characters in the 1965 issue that were part of the Avengers included Captain America, X-Men mutant Quicksilver (Pietro Maximoff), and Quicksilver's twin Scarlet Witch (Wanda Maximoff). 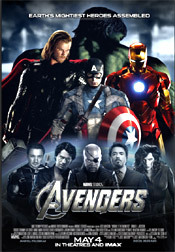 Writer/director Joss Whedon's and Disney's superhero ensemble film Marvel's The Avengers (2012), was from Marvel Studios. It was the sixth film in the Marvel Cinematic Universe. 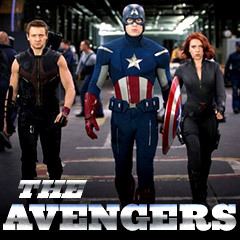 It was the highest-grossing (domestic) superhero film of all time for many years, with $623.4 million. (During its reign as the # 1 superhero film, the second-place superhero film wasn't even close, the Batman franchise's The Dark Knight (2008) at $534.9 million.) It was ultimately surpassed 6 years later by Marvel's Black Panther (2018) - the 18th installment in the Marvel Cinematic Universe. It featured a slew of iconic Marvel Comics superheroes - a group led by one-eyed, eye-patch-wearing spymaster Nick Fury (Samuel L. Jackson), the leader of a government high-tech law enforcement agency named S.H.I.E.L.D.. 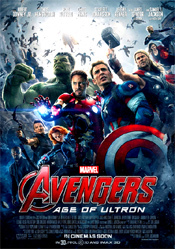 This was the third Avengers installment, a sequel to the previous two films (in 2012 and 2015). It was directed by Anthony and Joe Russo. It was the 19th film in the Marvel Cinematic Universe. The Avengers would join with the Guardians of the Galaxy to battle against supervillain Thanos who was attempting to acquire six Infinity Stones.